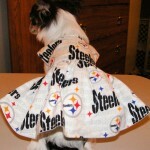 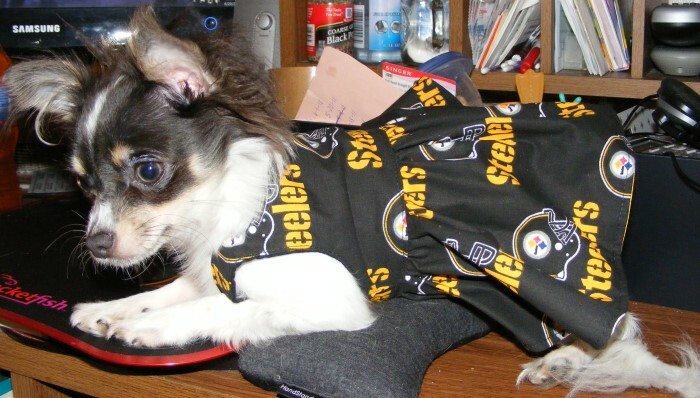 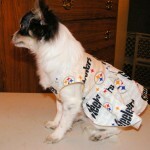 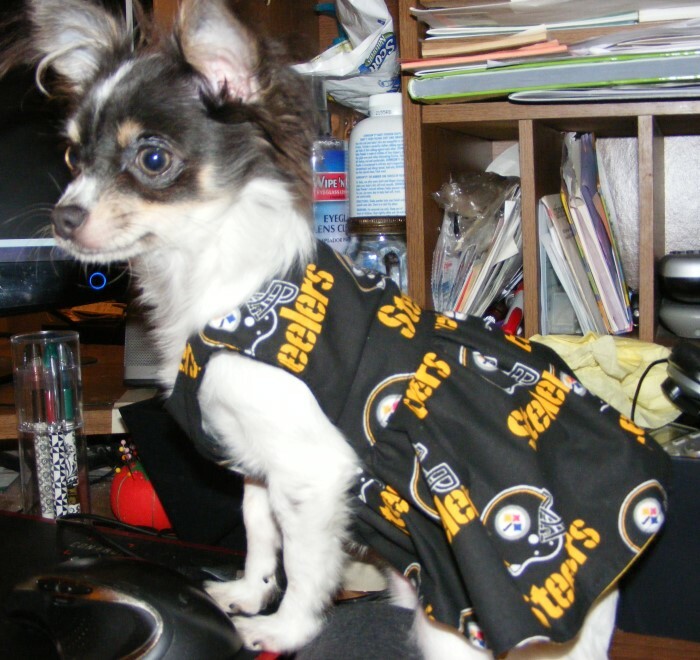 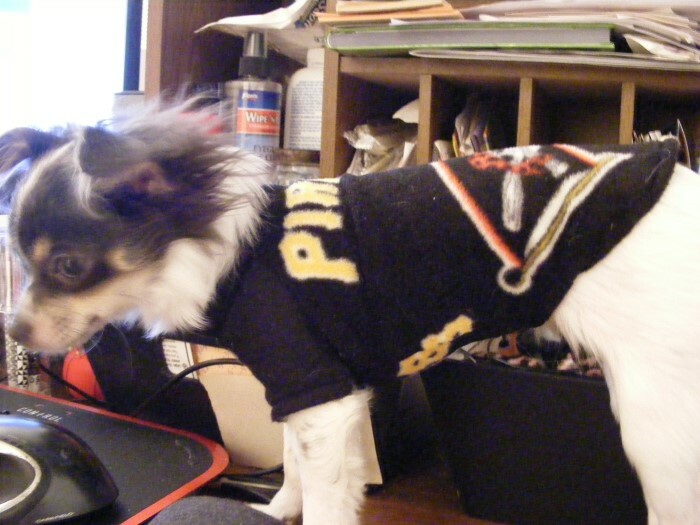 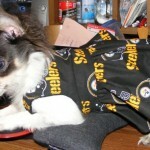 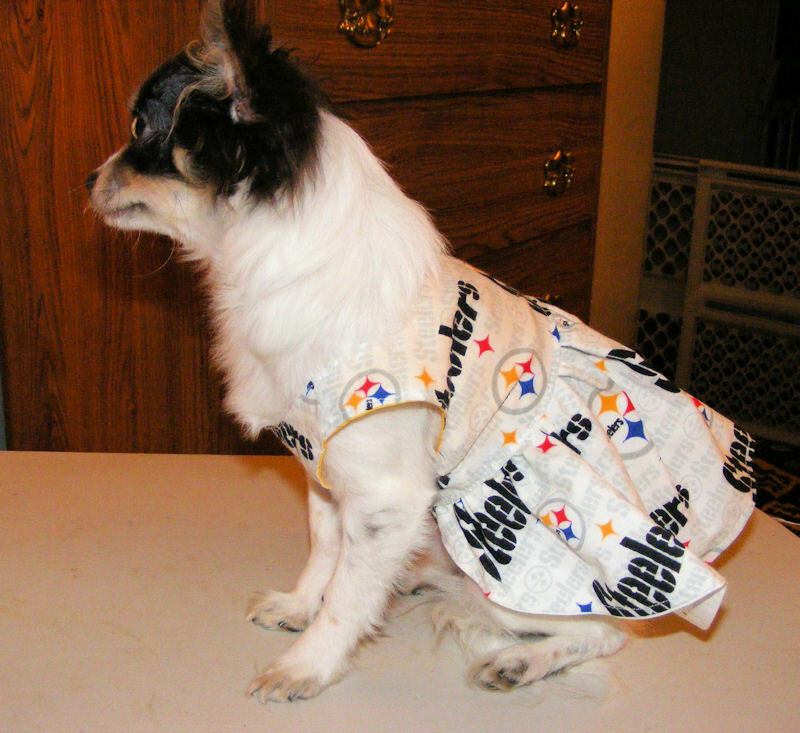 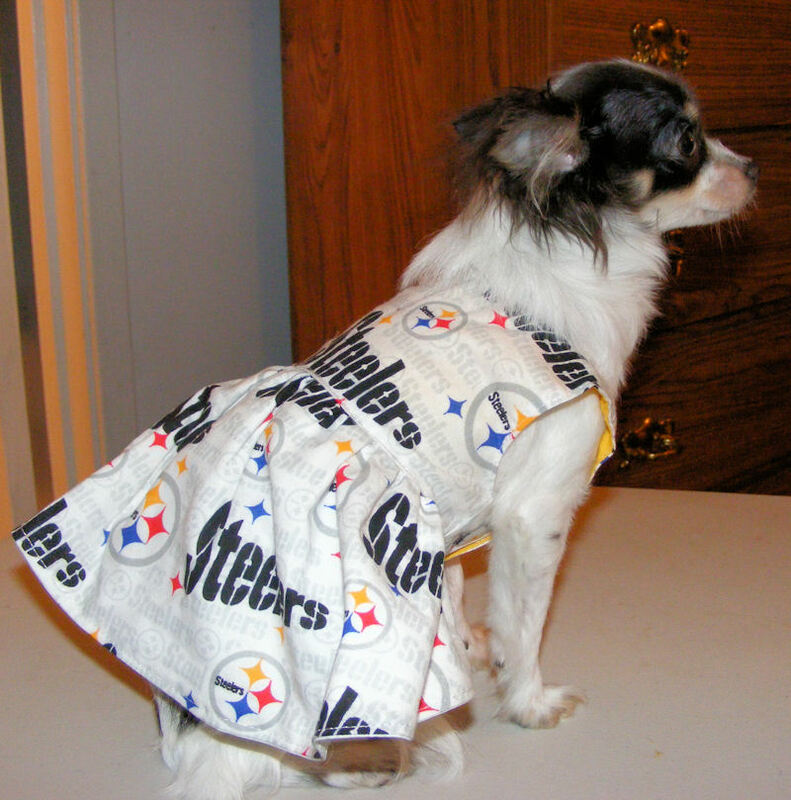 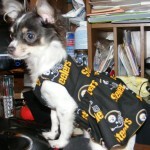 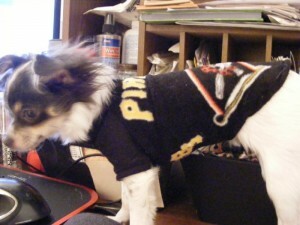 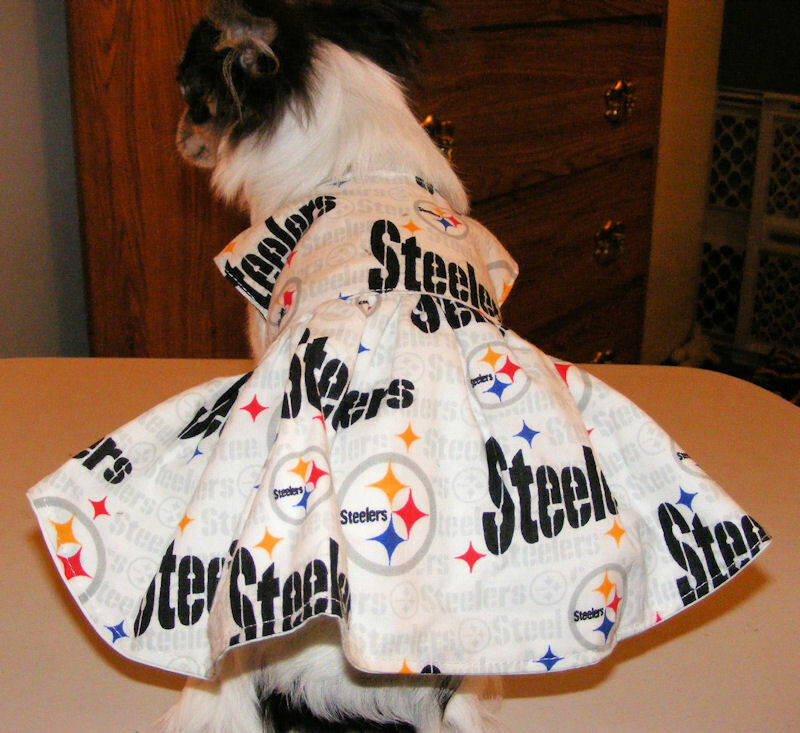 When I first contacted The California Chi about some custom work, it was mainly to get some clothes done in Pirates and Steelers fabric (to try and win John over to the dark side of dressing Chihuahuas). 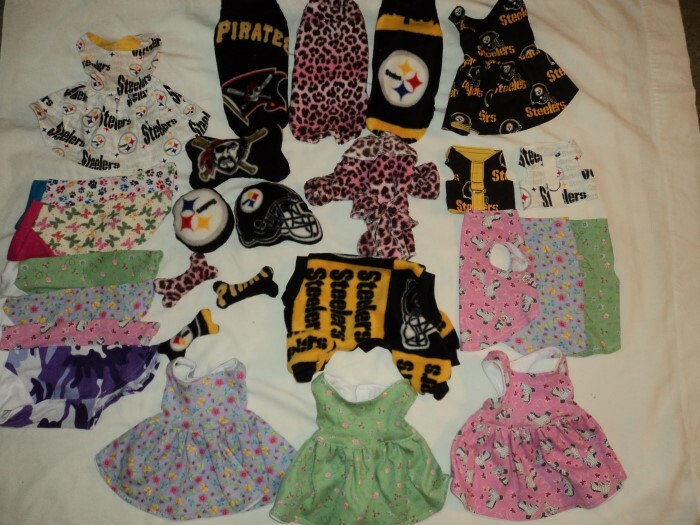 Unfortunately when we went to buy more fabric, we could not find either version of the Pirates fleece anywhere 🙁 Fortunately, I was able to scrounge up enough scraps that I had left over to send and get 1 shirt. 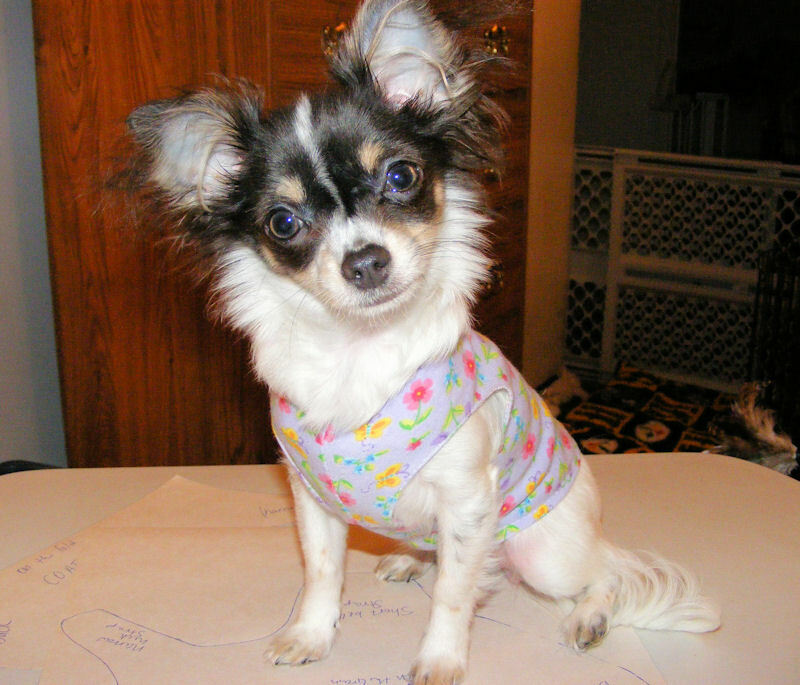 Today in the Tequila Wardrobe series, we are going to feature 2 great t-shirts from The California Chi. These are both from fabric that April had in stock. 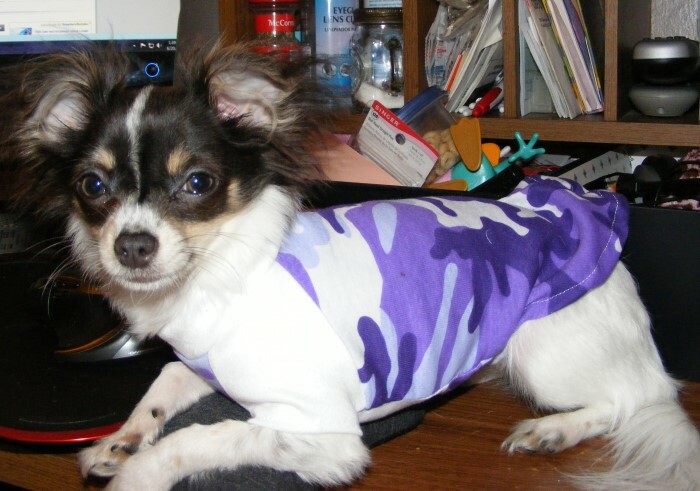 The purple camo one is a knit fabric and I think Teq looks absolutely great in purple 🙂 The pawprint fabric is a thermal or waffle knit and they are great year round. 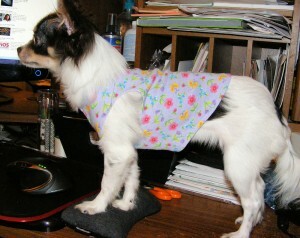 Teq loves them even in the summer, particularly because I keep the house a bit chilly for her tastes. 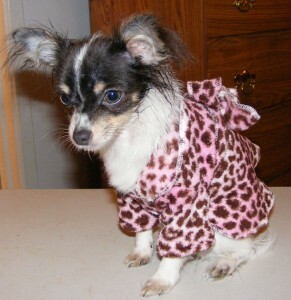 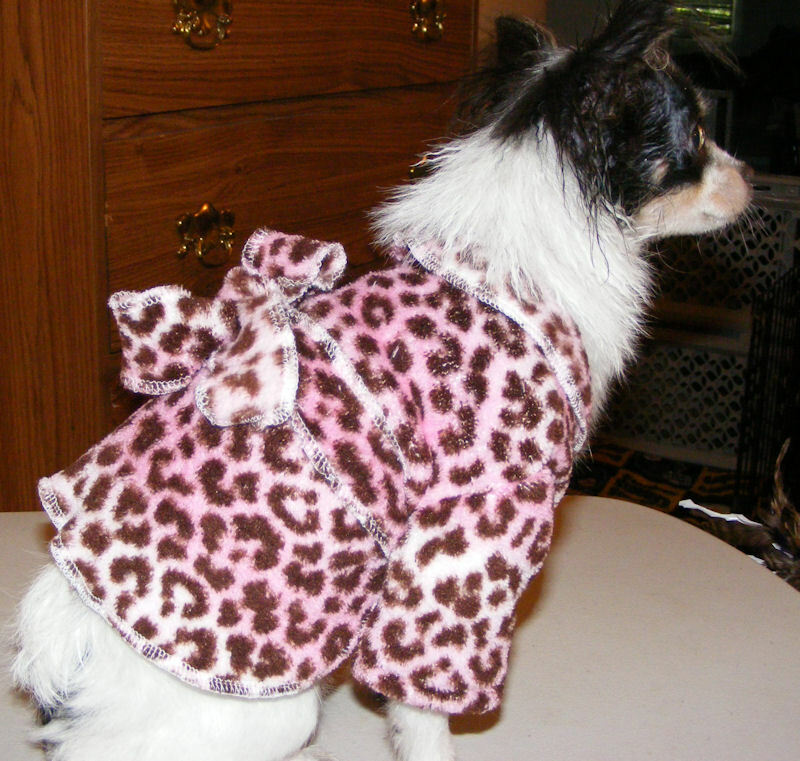 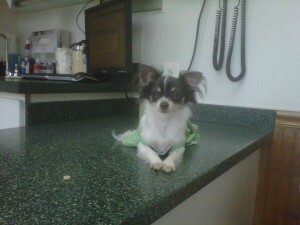 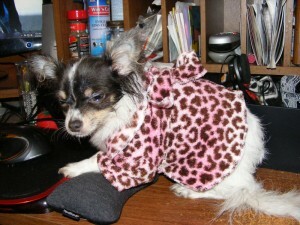 I saw a cute robe and wanted to get one for Teq for after her bath, but of course they were all way too huge for her. So I got some cute material and was just going to have April, at The California Chi, make me a shirt for her out of it. During our emails, I mentioned that I had wanted a robe for Teq, but just asked her for a shirt. 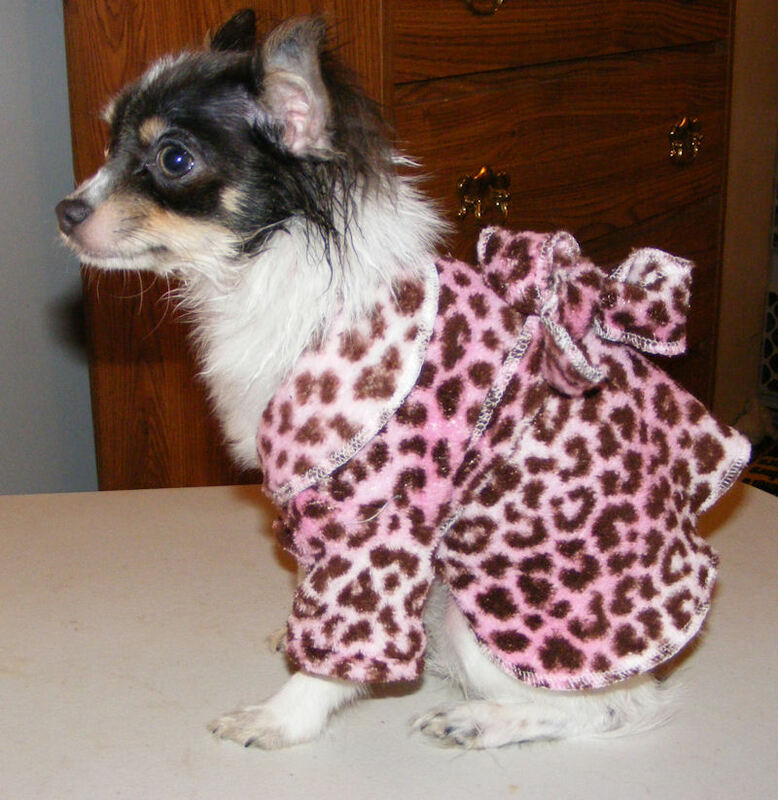 She surprised me with an actual robe, which I LOVE! Teq also loves it and wears it long after she is dry. I think she looks absolutely darling in it. 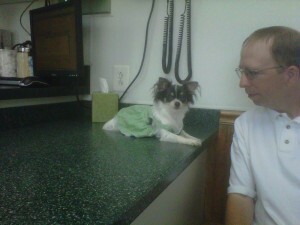 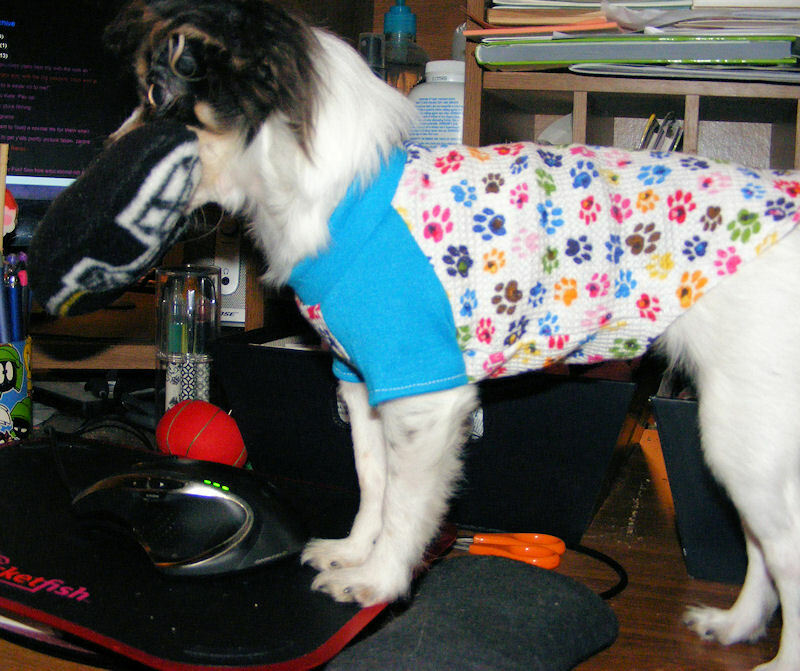 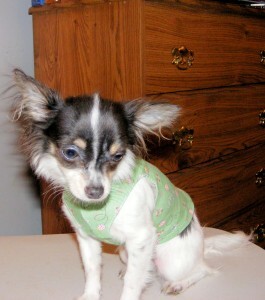 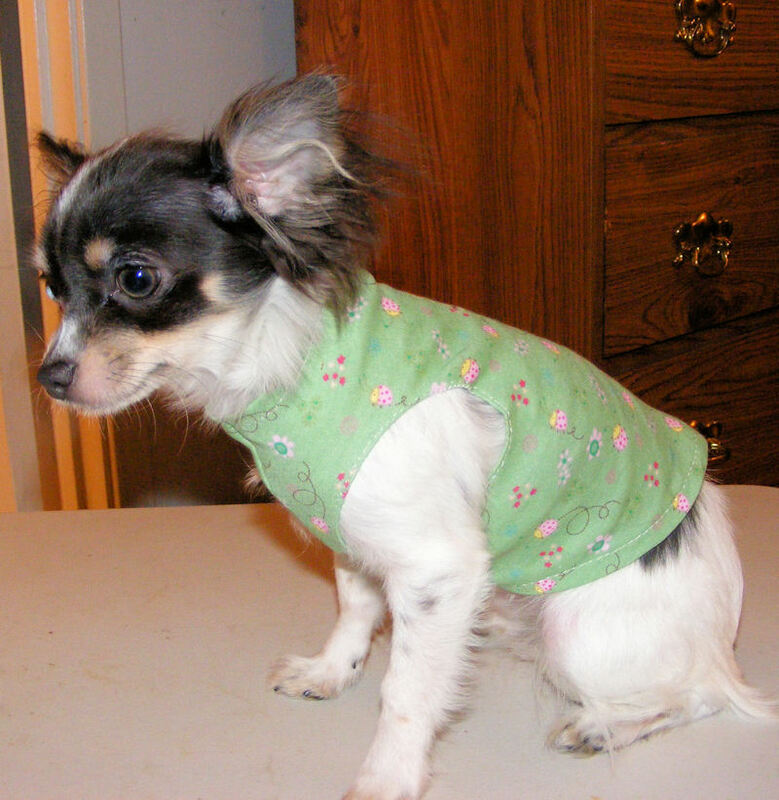 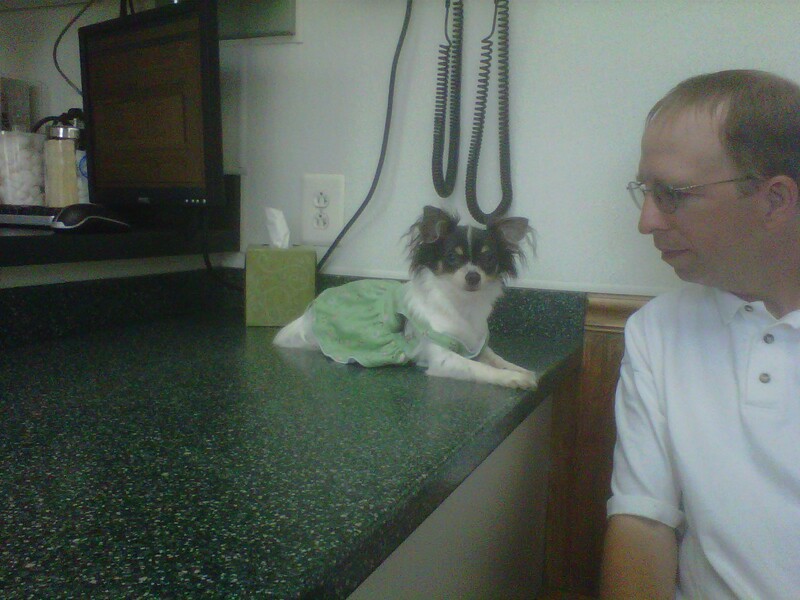 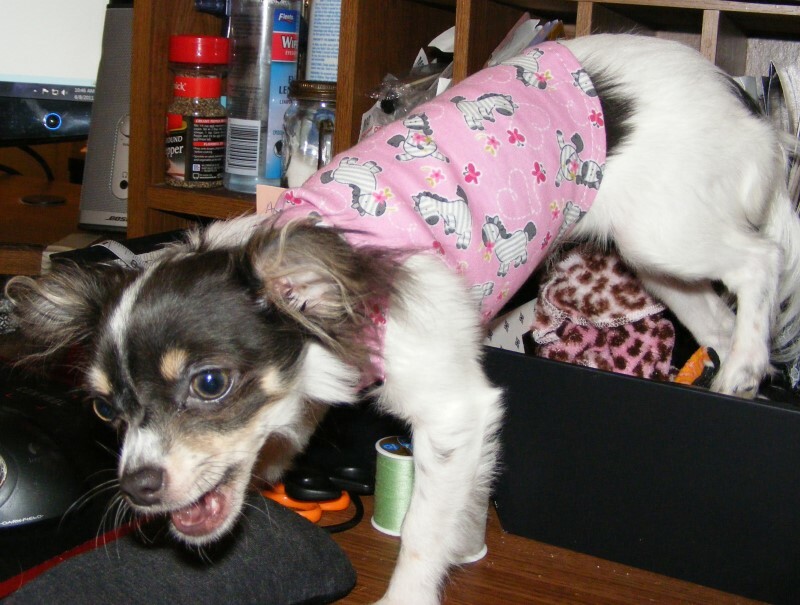 When Teq was very little, her Aunt Lisa sent her a great thermal shirt made by a woman named April from The California Chi. 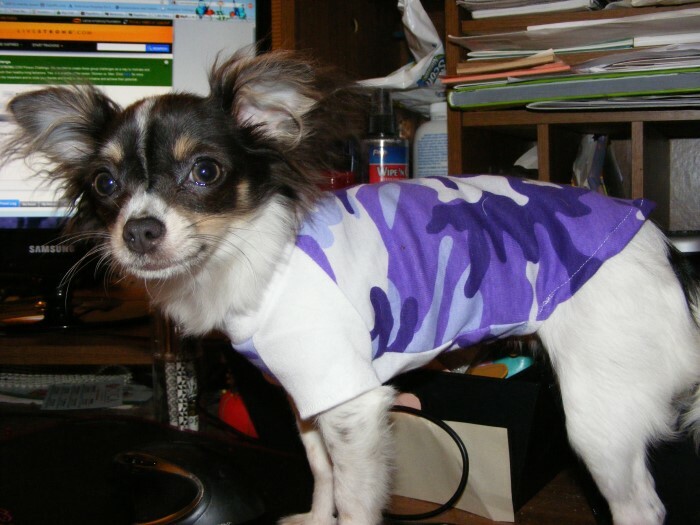 A while after that, I emailed April about ordering some shirts and then I asked if I could send her some fabric and have her make me some shirts from that fabric. 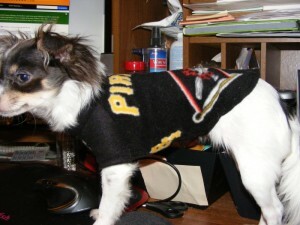 My original intent was to get a couple Pirates and Steelers things that John would like to see Teq in. 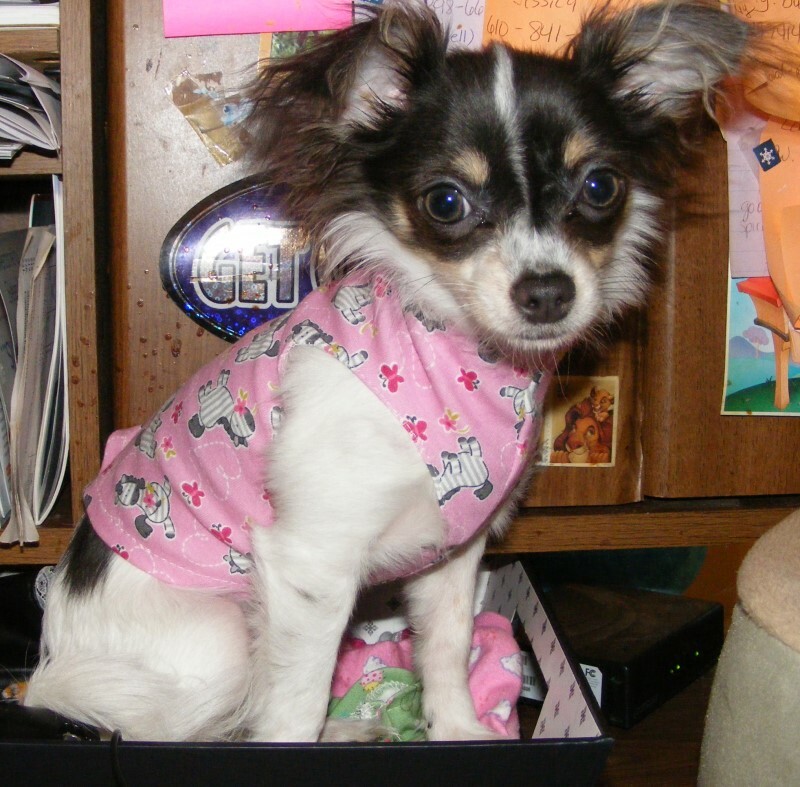 I haven’t even gotten all the stuff out of the box yet and gotten pictures of Teq in everything, but over the next few days, I will be sharing pictures of Tequila in her fabulous new wardrobe. She particularly loves the sleeveless shirts. 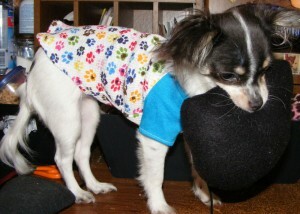 I have to fight with her to take them off once I put one on her. She wore one for 3 days in a row once before I finally forced her to let me remove it 😉 Usually she will strip herself when she gets too warm or tired of wearing a shirt, but she loves her some sleeveless t-shirts!